Can you judge a book by its cover? Does the external appearance (or morphology) of an individual tell you something about what's happening inside? Does knowing where an individual is physically found tell you something about what's happening inside? We're often told not to judge a book by its cover but is this good advice? Each year in my first year evolution course I run a game theory lab where the students use the principles of game theory to try and collect the most points in a series of exercises. Basically, they can choose when to cooperate or not cooperate with other players. I have run this lab for 10 years now and very early on I noticed that the winner of the one-off games always seemed to sit in the same part of the lab room (4 rows back and 2 in). This was the case in 9 out of 10 of the years. I'm not sure why this is the case but there you go. Additionally, I started picking three students in the lab prior to the game theory lab who I thought would win the game theory competition. It is not clear to me what traits I use for this but it seems that the covers did say a lot about what was inside and also that where the individual was also counted. For 5 years in a row I was right. This year my main choice sat at the back... what would win out? The individual or the position. Well the individual did win the game but the student in the position (4 back and 2 in) was second! So the cover judging seems to work (at least some of the time). In biology we often judge the content from the cover. If we look at two closely related species then we will use their slightly different morphology to identify which species they are in. If we find individuals that have bits of both species morphology then that suggests that the individual might be a hybrid. 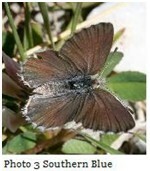 One example of this is with a butterfly genus found in New Zealand. Zizana has an almost worldwide distribution and there is some debate about how many species there are, although most agreement is that there are four. In New Zealand there are two species, Zizana labradus, the common blue, which is found in the North Island and parts of the South Island, and Zizana oxleyi, the southern blue, which is found in the South Island. The southern blue is assumed to be a native species while the common blue is found throughout Australia, Melanesia and Polynesia. The two species have virtually identical behaviour and habitat prefences and both use Fabacea plants as hosts. Visually, however, there are differences in the patterns on the respective species wings. Within the area between Blenhiem and Christchurch both species are found and a number of individuals that share mixtures of these patterns from both species. So the covers of these butterflies would suggest that there are two good species here with some hybrids being produced where the two species overlap in space. Ecologists at Lincoln University, Steve Wratten, Mark Gillespie, Rob Cruickshank and Ben Wiseman, have joined forces with the extremely experienced lepidoperist George Gibbs, from Victoria University, in order to explore the species boundaries of Zizana. They recently published their results in Systematic Entomology. They recorded variations in wing colouration and male genitalia. Why the fascination with male naughty bits? Often with insects a key difference between species, that are often morphologically similar, are their genitalia. If you think of the male genitalia being a key and the female genitalia as being a lock then only the right key, i.e. a member of your species, can use the lock. Therefore, mistakes in breeding between species are minimised. The team also looked at a group of mitochondrial and nuclear gene regions to examine genetic boundaries. Samples were collected from around New Zealand. Individuals with 'hybrid' genitalia and wing patterns were mainly concentrated around Kaikoura (north east South Island) which suggested that this was the boundary between species. However, mitochondrial DNA, which found a distinct difference between the two species suggested that the boundary was in the north west of the South Island. The nuclear genes found no significant difference between individuals in either species at all! So there is conflict among the data sets. Maybe the book shouldn't be judged by its cover? How to resolve this? The difference in pattern between the mitochondrial and nuclear genes is not uncommon. Mitochondrial genes change at a faster rate and so this result might represent a recent origin of the southern blue or that hybrid matings only occur between female southern blues and male common blues (mitochondrial DNA is only passed down the maternal lineage whereas nuclear DNA comes from both parents). Therefore, there will be no difference in nuclear DNA, as it constantly mixed between the species, but a clear difference for mitochondrial DNA. For similar reasons butterflies that look like common blues may have mitochondrial genomes of southern blues. What does it all mean? Are there two species of Zizana in New Zealand? The morphology and mitochondrial genes say yes whereas the nuclear genes say no. What would lead to this pattern? Either very recent speciation of the southern blue or a long period of hybridisation. What would help? If samples were obtained from Australian Zizana then this would shed light on whether Zizana had been hybridising for a long period of time. Can you judge a book by its cover? For Zizana you can in most of New Zealand but not in the northern South Island.